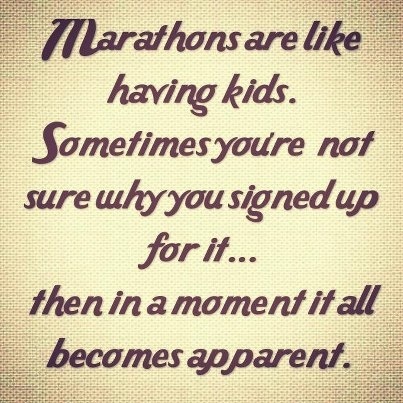 My name is Allee and I am a Marathoner. I still can't believe that I have entered the marathon club, I have conquered the runners Everest, well at least mine and I lived to tell the tale. Since I was running under my marathons mans bib, I do not want to get him into trouble so I have deleted a few posts and will refer to the marathon as "THE LONG RUN" in the "city that shall not be named". Apparently they do not like you running under some other bib, a big no-no but you know you us runners, we've got to run. It was a great first marathon. perfect running weather, great runners and great crowd support. I had a fabulous run, I felt great and with the exception of a few bathroom stops, it went as planned. For a first marathon, I think it went as good as it could, there are always things I wish I could change but no too much. My nutrition was good, only slight stomach issues, my legs felt great until the 18 mile mark and I managed to avoid THE WALL and any negative thoughts. My time did get slower for the final 8 miles, I was getting tired but that made sense. In my training most of my long distances were at a slower per km pace and race day I was running 45 seconds faster each km. In future I will want to add race pace runs at the end of my long runs to help me get better. I had the same issue with my half marathon until this years Army Run so I know you can get better and stronger at the finish. I was aiming for 4:40 to 4:45 and hit the half marathon point bang on pace, 2:21. I ended up running 4:52 so I lost time in the second half, I felt it and there was nothing I could do about it but I ran as fast as I could and never gave up. I saw a lot of people walking for the last 2-3 miles, I am proud that I never stopped. I saw my marathon man at the 23.5 mile mark and had my last gel and just kept running to the finish line. I did have my scheduled walk breaks, every mile marker and I walked through a few water stops to refill my bottles but I never walked when I should have run and I am really proud of that. After THE LONG RUN, I felt great, I had a few sore muscles and my toes hurt (which is normal) but I went for a walk to keep my legs from getting stiff and it worked. I had a celebratory meal, a hamburger with bun and fries and enjoyed every bite. I had not had gluten in 4 months but I did not care, I was having the burger bun. I figured my body would hate me the next day anyway so I might as well enjoy my treat. Well the next day, my body was not too mad at me, I felt great, the legs felt great and the burger bun did not seem to affect me too much. Now a few days on, I feel back to normal, I wanted to go for a run tonight but knew I should wait another day or so but I am looking forward to my first run back. I have a few weeks of reduced training and then it is on to the next challenge, I can run 13.1 miles and 26.2 miles so why not try one each on consecutive days...well it seemed like a good idea at the time. I am so looking forward to the Goofy, I think. Any thoughts on Goofy training yet? I think the plan I'll work up will basically be shorter run one day, double the distance the following day, then a rest/x-train day. And of course longer weekend runs, but sticking to the doubled distance the next day. It's going to be fun!